(by Nick Allen, London’s Daily Telegraph) WASHINGTON, D.C. — Hillary Clinton plans to “get under Donald Trump’s skin” and provoke him into losing his temper in front of 100 million people at the first US presidential debate, but experts warned the strategy could backfire if she descends to her opponent’s level. Rather than focusing on policy Mrs. Clinton’s campaign has decided to turn the epic showdown on Monday night into a referendum on Mr. Trump’s temperament and character, hoping to goad him into an outburst that will make him look “unhinged,” her allies said. Any wild reaction by the Republican nominee, who has a history of responding explosively to perceived slights, would be used by Democrats to show he is too volatile to be put in charge of America’s nuclear arsenal. As details of Mrs Clinton’s strategy leaked Mr Trump vowed he would not take the bait, and would “stay cool” during the clash at New York’s Hofstra University. Mrs Clinton’s plan includes trying to rile Mr Trump with taunts that he is not worth as much money as he claims, and that he is a liar, xenophobe, and sexist bully. NOTE TO STUDENTS: Many issues can be controversial. While you might not feel strongly about a certain topic, others around you might take a strong position on one side or the other. Learn to logically defend your position, and politely respect your neighbor’s point of view. And if your neighbor gets argumentative with you, remind each other that both sides need to be tolerant of the other’s point of view. 1. Read the “Background” below. What is the central focus of a presidential debate? 2. a) What strategy does Hillary Clinton plan to focus on, according to information leaked from her campaign? b) What is her goal for doing so? 3. How did Donald Trump respond to the details of Mrs. Clinton’s strategy? 4. What types of accusations does Mrs. Clinton plan to use in an attempt to rile Trump? 5. Donald Trump is participating in his first one-on-one debate. He has never run for political office or taken part in debates until the group debates during the presidential primaries. Hillary Clinton has participated in numerous debates and has spent her life in politics. In July, President Obama hailed his former secretary of state as they stood beside each other at their first joint campaign event of 2016, calling Hillary Clinton the most qualified man or woman to ever seek the White House. a) If this is so, do you think her strategy against Trump will be successful? Explain your answer. b) If this is so, should her strategy by necessary? Explain your answer. c) Mrs. Clinton has invited billionaire Mark Cuban, who supports her candidacy, to the debate with a front-row seat. Democrat Cuban and Donald Trump have had public disagreements in the past, and it is believed Mrs. Clinton is attempting to get under Trump’s skin with her guest. Do you think this is a good idea? (Would your answer be different depending on which candidate you support?) Explain your answer. d) Ask a parent: How important is it to you for the candidates to explain his/her positions on the issues? Or is it more important to see which candidate appears calm and sounds presidential? Please explain your answer. 6. Watch the first presidential debate tonight. a) How successful was Mrs. Clinton’s strategy? Was she able to goad Mr. Trump into appearing volatile? Explain your answer. b) What do you think was Hillary Clinton’s best or worst line? Explain your answer. c) What do you think was Republican challenger Donald Trump’s best or worst line? Explain your answer. For additional election information, visit the StudentNewsDaily Election 2016 page. The central focus of a presidential debate should be to provide voters with information they need to measure the suitability of the candidates for the White House. 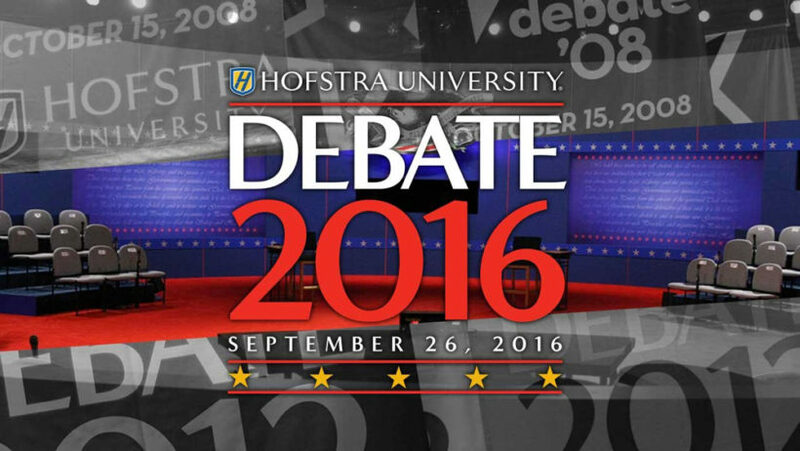 All debates will take place from 9:00 – 10:30 p.m. Eastern Time. The Commission on Presidential Debates was established in 1987 and has sponsored all presidential and vice presidential general election debates since 1988. Visit the Commission on Presidential Debates library to view Presidential Debate History.